This new feature is being trialled in New Zealand. It is only fair that Kiwis be granted the occasional perk — connectivity in this country being so shonky, it’s sweet to be ahead of the game for a change (see Paying by the Bit: Internet Access in New Zealand, 15 January 2010). Facebook appears to be testing this new feature selectively; not everyone I’ve spoken to in New Zealand has access to it yet. And among those of us who can highlight their posts, the company is trying out two models, presumably to see which one will gain more traction. While Facebook wants to charge me two dollars per post for the privilege of highlighting a post, Deb paid nothing to put her client’s update at the top of their friends’ news feeds. Facebook is no doubt hoping to establish how many people are likely to be willing to pay for the feature and comparing that revenue against the associated increase in traffic. So what do you get for your money? Not, at first blush, an enormous amount — a highlighted post stands out in a news feed thanks to a yellow background. Or perhaps not. Some Facebookers report seeing highlighted posts pinned to the top of their news feeds; in my news feed highlighted posts are indistinguishable beyond the word “highlighted.” And as far as I can tell, Facebook’s iPhone app has no way of identifying highlighted posts yet. But if Deb’s experience is in any way typical (and, of course, we’re assuming here that highlighting a post was, at the very least, a contributing factor in its virality), then it’s money well spent. And of course, it’s almost certain that if highlighted posts become commonplace, they too will fade into the background of social chatter noise. Facebook is saying nothing so far about when this new functionality might makes its way around the world, or whether it will be paid or free. For now, they appear to be detecting potential guinea pigs by New Zealand IP addresses, but, interestingly, still honouring our currency preferences; knowing that I’m British, Facebook wanted to charge me £1.29. Why Facebook chose New Zealand as a testing ground remains unclear — perhaps Mark Zuckerberg is a massive Lord of the Rings fan, or perhaps we’re an English-speaking market that’s just the right size for a test. But for now, a couple of dollars is a small price to pay to become, as Deb’s grateful boss put it, the queen of social media for a day. I'll be very interested to see how this ends up working, since I can't imagine most people (as opposed to businesses) wanting to pay to highlight posts, and I expect that most people reading will gloss over highlighted posts once they're no longer novel. I have the free highlight feature at the moment, but I won't use it. I don't want me friends to think I'm so arrogant that my post deserves more attention than everyone else's. Likewise, if I see a highlighted post I'll assume that person is very arrogant and most likely remove them from my friends list. I have noticed it a couple of times on my posts, but mine is the 'paid' version and it asks me for pounds sterling, which given that I am not british, I find interesting and choose not to go any further! However the option only seems to be there for limited time as I can't seem to find it on my wall again at the moment! Make sure friends see this. On average, highlighted posts get 40% more likes and are seen by twice as many friends. Your friends won't be told you Promoted this." This now costs £0.53 — a bargain. That last bit, by the way, is a fib. I just promoted a post; it didn't get any special billing on Deb's news feed, but it did carry a label saying "highlighted." 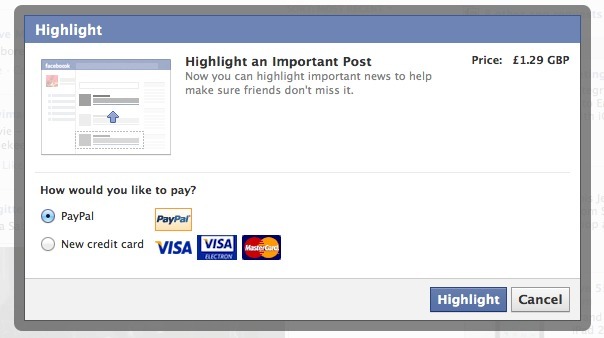 Do you think that nice Mr. Zuckerberg will give me my money back? I understand the Timeline feature was also released first in New Zealand.